Another interesting documentary I saw on the plane back to Hong Kong was called Swim the Channel, released in July this year. While I'm a decent swimmer in the pool, there are some people who have swum or want to swim the English channel. 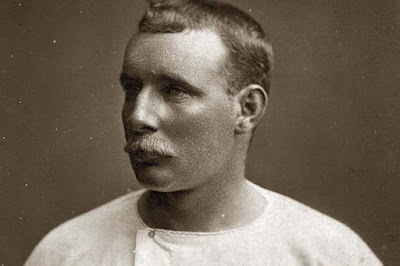 The first person to do it was Captain Matthew Webb in 1875, and statistically there are more people who have conquered Everest than swim across the 21-mile Channel at its shortest distance. A group of them meet every weekend in Dover between May and September, all shapes and sizes -- come to think of it hardly any of them were lean and buff. They don't wear wet suits either -- just their swimsuit, cap and goggles. Some retirees voluntarily come to train and feed them. One of them, Freda, nicknamed "The General", barks advice at the swimmers from her armchair and has some salty comments. 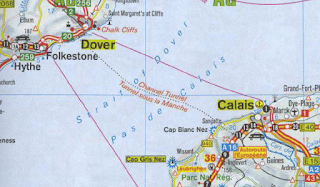 Her daughter had swum the English channel a few times and in the film she remarks how emotional it is for a swimmer to complete the distance as well as their supporters. Another retiree makes it his job to rub down swimmers with grease in spots where they can chafe, and he wears funny outfits to bring levity to the atmosphere, even though it is quite genial. Swim follows a few swimmers who are determined to make their mark -- have their names on the wall along with the date and time they swam across the Channel. One is a guy who swam the Channel five years ago wants to attempt it again, but doesn't take his training seriously. Needless to say it was quite a struggle for him when he actually attempts the swim. Another is Georgie, a teenager who wants to prove that a young person with diabetes can achieve big goals like this physical challenge. 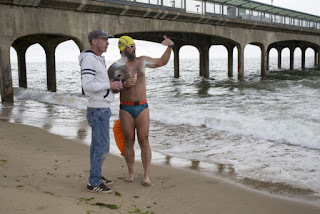 Another is a middle aged father and husband with a day job who suddenly became obsessed with swimming the Channel and wanted to do it in memory of his son who had cerebral palsy and died at 10 months. His previous training in the army gave him the discipline to train hard. And then there are the pilots, the captains of small boats that know the Channel well and are willing to help these swimmers realize their dreams, but also watch out for their safety in case conditions get too dangerous. Swim is fascinating look at very ordinary people who happen to swim well and their determination to make it across someday.